Native white pine stained with non-toxic stain. Attractive copper roof. One hole for bird entrance and exit. Hangs easily. Opens for cleanout. Bottom slides out for easy cleaning. 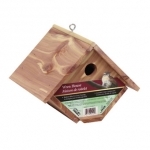 Classic design wren house with 1-inch entrance hole. Bottom slides out for easy cleaning. Wrens are attracted to birdbaths and seek thickets where they can hide. A wren&#39;s natural food is primarily insects, grasshoppers, spiders and caterpillars. 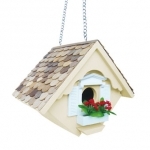 Instructions for use: enjoy watching these beautiful birds in your backyard by hanging this house 10-feet above the ground. Proudly made in the USA by Amish craftsmen. 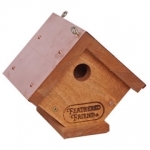 This hanging house is designed to accommodate house wrens, one of the only species that tolerate a swinging nest box! Topped with western red cedar, this charming little cottage has a window box frame and planter with decorative flowers (removable for outdoor use). Fully functional house has a bottom panel that can be easily removed for yearly cleaning. Sturdy brass chain. Traditional wren house. Field tested and ornithologically correct to attract wrens. Handcrafted. Made of natural cedar. Metal hanging cable attached. Easy to clean. Made in the USA. Stamped with the official Audubon logo.